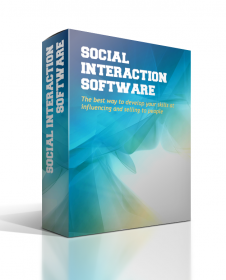 The Social Interaction Software is an effective and clever software package that helps busy people tailor their presentation techniques by taking into account their personality strengths and the needs of the people that they are interacting with. It provides advice on how to best appeal to different types of people. Although it has many wider applications, it is particularly useful as a training or practical aid for sales people. The Social Interaction Software is designed to help sales people identify the optimal sales style. Only by tailoring his or her style to individual clients can sellers be sure to make an impressive presentation. By means of a simple classification system the sales person and the client are classified into one of four types as shown above. The software produces a game-plan of the optimal selling technique of the sales person to the client. A report is produced that lists the key elements of a successful presentation to a particular sales-person. The Software is used to train staff in the need to have different selling styles and by staff to plan a sales meeting with an important client. The questionnaire and software of the Social Interaction Software are copyright by Cymeon 1998.